Start out your weekend right. And by that, I mean with plenty of cheese. The 2nd Annual Wisconsin Grilled Cheese Championship will be held this Saturday at the Iowa County Fairgrounds, in Mineral Point, Wisconsin. Doors open to the public at 9:30 a.m. and the grilling begins at 10 a.m.
Spectators get in free, but pre-registration is strongly encouraged. Pre-registration is required to compete. Refreshments will be available for purchase, including – what else? 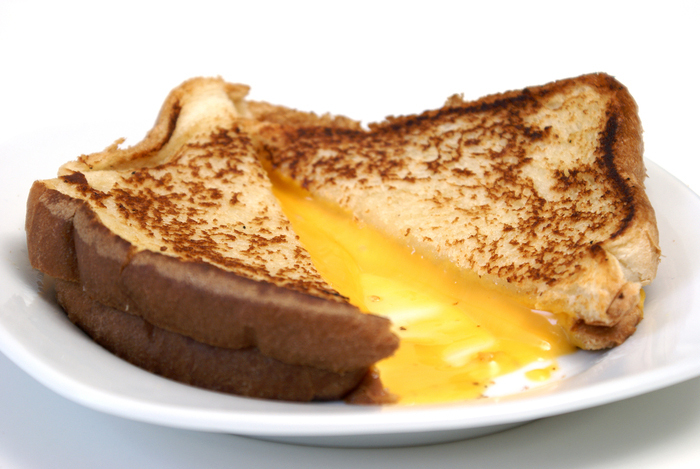 – grilled cheese sandwiches. Tomato soup, beer, wine, water, and soft drinks will also be sold. Eight judges will have the pleasure of tasting the cheese concoctions, including local food blogger Keith Burrows and Wisconsin Foodie Kyle Cherek. For a complete schedule, competition rules and more details, go here. This entry was posted in Entertainment, Food and tagged Keith Burrows, Kyle Cherek, Mineral Point, Wisconsin, Wisconsin Foodie, Wisconsin Grilled Cheese Championship. Bookmark the permalink.